This is the only yuzu powder left. Definitely not enough for another batch. Looking forward to use KICKAPOO soft drinks. Will it be able to help in maintaining the citrusy flavour ???? Will find out later on. (1) combine koh fun, yuzu powder & sugar into a big bowl and mix well. (2) next, rub in shortening till its well cooperated with flour mixture. (3) stir in cold drinks till soft dough is formed and knead till smooth then divide into 85gm each, about 7 portions. Beat all ingredients till combined then transfer to a small round container, keep the lid on then chilled to set. When ready, cut it into 6 equal portions. Its best to keep it refrigerated all time whenever its not in used. And best to prepare this overnight. When everything is ready, just wrap cheese filling into mung bean paste and nicely sealed. Next, wrap the mung bean filling into yuzu snow skin dough, nicely sealed and shape it into a ball. 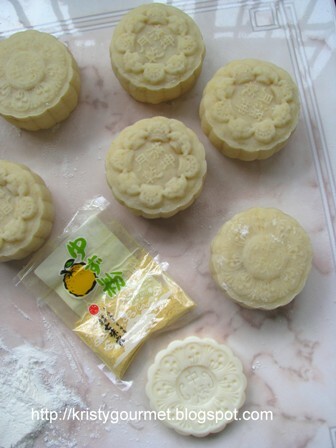 Coat the round mooncake dough with extra koh fun to prevent sticky surface. 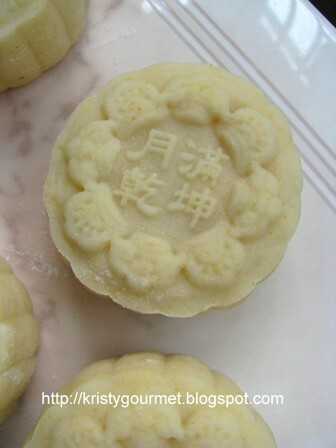 Finally, press it with a mooncake mould. And its ready to serve. The cheese filling looks like melting away but it is not ! It turns out really creamy... like eating an ice-cream. Don't you love the sound of it ??? haha.... I'm actually looking forward to more cream cheese fillings mooncake after this. Yes, it is absolutely addictive ! How not to say NO ! >o< Enjoy & have fun guys ! 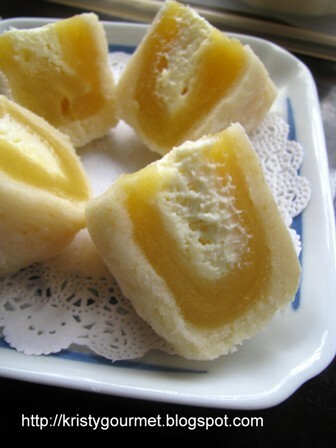 Love your cheese mooncake, this is what I looking for this year! Can you finish all the mooncakes you have been making :-))? I just need a couple of them to satisfy my craving!! Hi, where to buy yuzu powder? 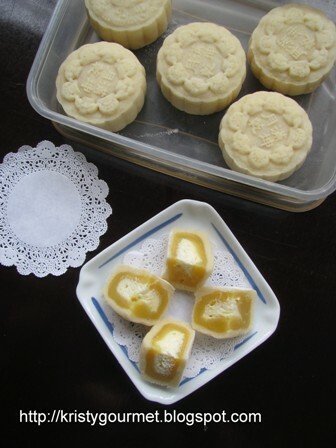 This unique combination that you used to make these yuzu mooncakes sounds wonderful! Hi Kristy. You do have some great creations of mooncakes! Good job!